Earlier this week I decided to FINALLY work on a project that I have been thinking about for a while (I mean, honestly, I might have saved the bottles for about 6 months now...). 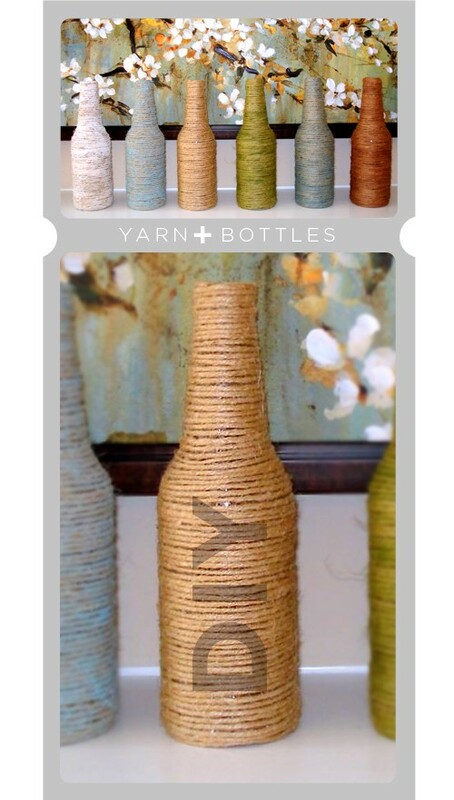 I saw these wrapped bottles on Pinterest a while back. I thought they looked super cute, and since I had some left over yarn from the last Pinterest Project I made, I figured I had all that I needed, I just had to DO IT. These were wrapped with more of a hemp than yarn. These were wrapped with brightly colored yarn. Here are a few pictures I took. I didn't get any process shots, probably because Ryan was working on art while I was doing it, so no one was free to take pictures. I have another bottle to wrap though, so maybe I will get a new the next time. I really like the way it turned out. I like the gray color. Now I just need to find some fun things to put in the vases.